Yesterday we learned that Revo will be hosting a talk show event at ANIME FESTIVAL ASIA 2014 in Singapore. 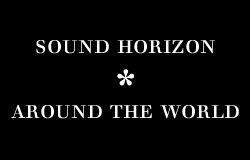 The event, consisting of a screening of The Assorted Horizons (Theater Edition) and a talk session + Q&A with Revo, will take place on December 4 2014, the day before the actual convention starts. There are no further details regarding the event (official note in English here). Revo hasn’t been known to attend conventions before, let alone one outside Japan. Most of Sound Horizon’s overseas activity has been centered in South Korea and Hong Kong so far, so this talk session at ANIME FESTIVAL ASIA 2014 in Singapore is definitely a breakthrough. Revo’s rise to popularity, fueled by the success of anime Shingeki no Kyojin and last year’s performance at the Kohaku Uta Gassen, is giving Sound Horizon and Linked Horizon an unprecedented amount of attention from overseas media. ANIME FESTIVAL ASIA 2014 SINGAPORE is an example of that, but hopefully this is just the beginning. Perhaps we are now a step closer to a Sound Horizon event in Europe or America? Previous post10th Anniversary Fan Club Event, new Story CD, and NEW SH MANGA?? 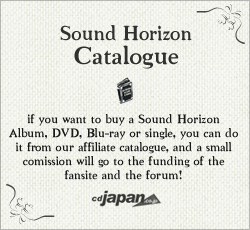 Next postCheck out Linked Horizon's Opening theme for the Shingeki no Kyojin 1st movie!